Jewelry that identifies someone as a caregiver is probably the last thing on anyone’s mind when dealing with a transition into the role of caring for a loved one. After all, bracelets and necklaces may not seem to serve any purpose beyond decoration, but during an emergency, being easily identified as a caregiver can be necessary. 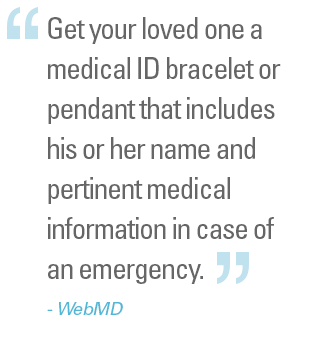 Unlike medical IDs for people with certain conditions, IDs for caregivers provide let emergency personnel know that someone is dependent upon the person wearing the ID. That dependent person may not be able to move freely or speak for him/herself, requiring the aid of the caregiver. Being a caregiver is not something that you advertise, so having a medical ID that identifies you as one, provides valuable information about you and the person you care for. Whether an emergency happens with your loved one nearby, or while you’re away from the person you care for, an ID can inform emergency personnel that someone is depending on you, and they can make appropriate medical decisions. Care recipients are recommended to wear a medical ID engraved with a brief description of their health conditions, medications, food, drug or insect allergies and the caregiver's contact information. If you wish to provide more information on your ID, we recommend engraving "see wallet card" and include additional instructions on a card you carry in your wallet or purse. Just like medical IDs for people with certain conditions, it’s important to wear your caregiver bracelet at all times and especially before leaving the house. Always wear the bracelet where it can be spotted easily and avoid taking it off. New designs will keep it from cramping your style and it can make a huge difference during an emergency situation.